Even if you don't think you are an artist, we think you are. In fact, we think everyone is an artist in some way. We welcome anyone into the guild, accomplished artists, budding artists, art lovers and people who are just curious about art. The Cabarrus Art Guild is an incorporated group of artists and others dedicated to the advancement of the arts for educational and cultural enrichment, with an emphasis on encouraging the creative process in a diverse population - providing opportunities for volunteering, exhibitions, public appreciation, and art education. The Art Guild was established on April 24, 1970, with seven Members. Today we are a group of many more art lovers, and growing. We have hosted many fantastic and well known artists at our monthly meetings. We offer several classes to members and non-members (non-members pay an increased fee) during the year, including painting with oil, watercolor, pastels, and acrylics. The Cabarrus Art Guild is a 501(c)(3) nonprofit corporation. Our monthly meetings are held at various locations. Want to join? Just Click the button below and follow the instructions on the " Join" page. Questions? Contact us. 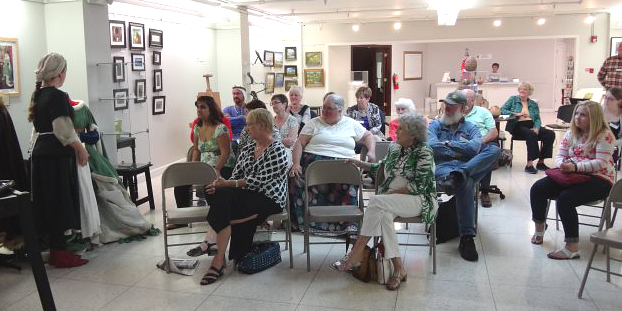 Join The Cabarrus Art Guild! Bring your project and work with other artists at our weekly open studio. We meet on Tuesdays from 11:00 am to 3:30 pm at ClearWater Artist Studios, located on the lower level, on the Kerr Street end of the building. Or just stop by to visit!